As someone who eschewed college and instead embarked on a long journey of dedicated radical self-education, I find it quite illuminating that it took so damn long for me to finally encounter the work of Andrea Dworkin. It’s hardly a coincidence that none of my subversive cohorts ever recommended a feminist pioneer like Dworkin to me during the past decade or two. The more I read of her work and the more I listen to her blunt analysis, the more I comprehend why she's been either erased or demonized -- by the mainstream and right wingers, of course, but also just as vehemently by the denizens of the so-called Left. Regardless of one’s alleged political beliefs, patriarchy still rules the day. In a more general sense, it’s illustrative to witness the palpable discomfort caused by my endless evolution. But then again, perhaps friendships based on shared ideology are more often than not doomed. All that said, please allow me to be clear: I am (at best) a work-in-progress and I deeply lament how long it’s taken me to better understand the foundational power of patriarchy. I think back with profound regret on some of the stances I’ve held, the publications and websites for which I’ve written, the movements I’ve trusted, the opinions I’ve shouted from stages all across the country, the former comrades I’ve defended, and the books I’ve authored (I’d seriously like to edit or erase all 13 of ‘em!). I feel shame, but not surrender. I'm fueled by an intense desire to make up for lost time and commit myself more than ever to identifying and rejecting the conditioning that’s shaped/warped me. To tear down, as Miss Andrea exhorts, what needs to be torn down. I have a long, long way to go and will undoubtedly falter but, regardless, I will continue to do my best to live up to the standards I’ve detailed here and the standards that courageous visionaries like Dworkin have established. I can finally see that since everything females do to resist patriarchy has been pornified, commodified, weaponized, and used against them, the change must begin with us men. As I’ve written before, if men want to live up to self-anointed labels like activist, revolutionary, radical, ally, and comrade, the path is clear. We are required to do almost all of the initial work and make (by far) the biggest changes and commitments. If we care about justice and liberation as much as we claim we do, now is the time to look in the mirror, to call ourselves out, to check our egos and our masculinity programming at the door, and to make what appear to be major sacrifices (pro tip: they’re not). We men must name the problem, over and over again, until we stop being the problem and stop passing on the problem to the next generation. Postscript: For anyone seeking to experience the transformative work of Andrea Dworkin, I’d humbly suggest you start with the aforementioned memoir. Also, you’ll find PDFs of all her books here and many audios here. Lastly (for now), this 47-minute documentary is essential viewing (trigger warning for survivors of sexual abuse). 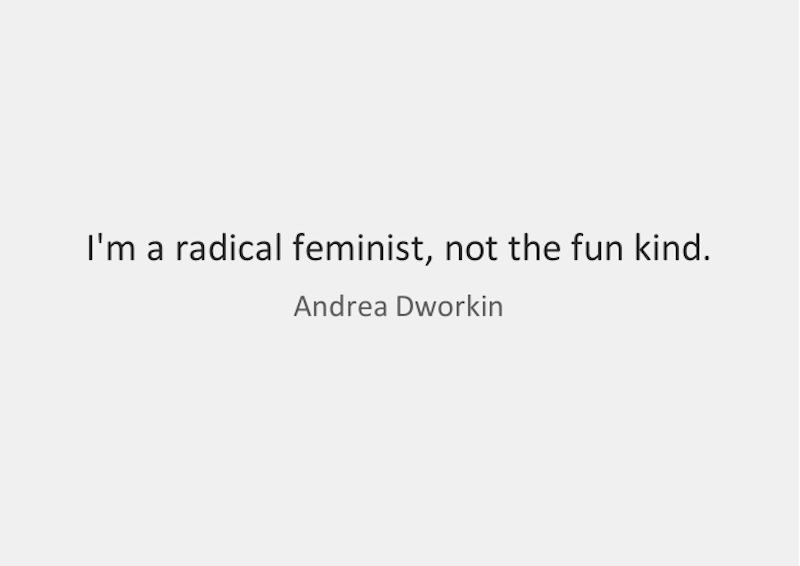 Thank you, Andrea Dworkin by Mickey Z. is licensed under a Creative Commons Attribution-ShareAlike 4.0 International License. Based on a work at http://worldnewstrust.com/thank-you-andrea-dworkin-mickey-z.